The Karters is an arcade karting game developed by 10Ants Hill. Compete and challenge your friends in a local or global multiplayer where only one can win. Pick one of the thrilling maps and try to find alternative routes to outsmart your rivals and get the gold. Play through the Adventure and challenge your friends in the Arcade. Remember, if you are tired of getting hit by that pesky rocket you can race your friends in our Speed mode. 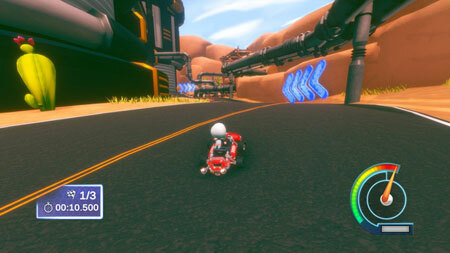 Dodge toxic barrels, collect fuel, find hidden letters and even race with your friends in a relay race. The game features 6 characters, 6 exciting maps, and 9 powerful weapons. If you get stuck in the game, check out the video walkthrough and gameplay for the game. This entry was posted in PC Games, Walkthrough and tagged The Karters Cheats, The Karters Game, The Karters Gameplay, The Karters Guide, The Karters Hints, The Karters Review, The Karters Solutions, The Karters Strategy, The Karters Tips, The Karters Walkthrough by Marvin. Bookmark the permalink.